Welcome to the Wild Kingdom! Itâ€™s a tough world out there where animals are always fighting over territory and only the strong will survive. Take charge of your very own army, each animal armed with unique moves and special abilities, as you battle through swamp and jungle to become king of the Wild Kingdom! 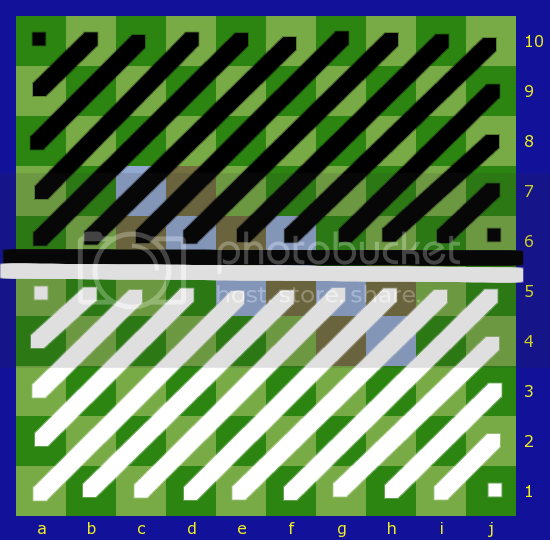 The above image is that of the game board. It is a 10x10 board filled with different colored squares. 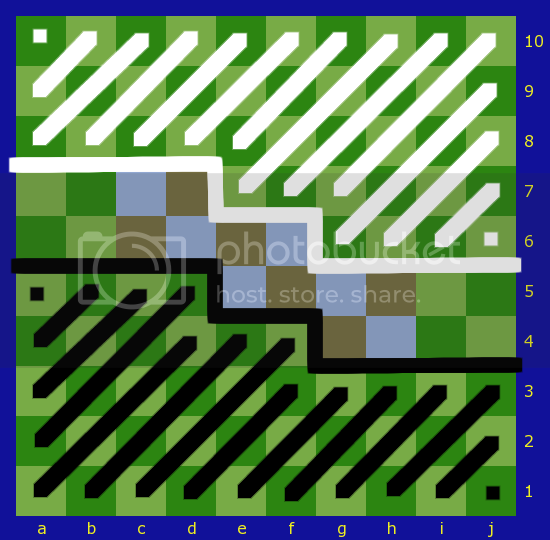 The alternating green squares represent the jungle squares, while the blue and brown alternating squares represent the swamp squares in the jungle. The purpose of these squares will be explained as you come to know the animals and how they move. For annotation purposes, each row is numbered 1 through 10 and each column is lettered a through j. The square a1 should rest at the left side of the player who uses the white pieces. White: Frogs â€“ all of row 2. Crocodile â€“ h4. Lion â€“ e1. Hippo â€“ d1. Porcupines â€“ b1, i1. Rhinos â€“ a1, h1. Giraffes â€“ f1, g1. Jungle Spiders â€“ c1, j1. Black: Frogs â€“ all of row 9. Crocodile â€“ c7. Lion â€“ f10. Hippo â€“ g10. Porcupines â€“ b10, i10. Rhinos â€“ c10, j10. Giraffes â€“ d10, e10. Jungle Spiders â€“ a10, h10. The preset for Wild Kingdom can be found here. There are a total of (9) unique animals in the Wild Kingdom. Each has unique movement patterns and a set of their own special abilities. Frogs â€“ Frogs are the smallest and most abundant of all the Wild Kingdom animals. Frogs move (1) space diagonally, but are not able to capture in this way. They may also leap (1) time directly over an adjacent animal. 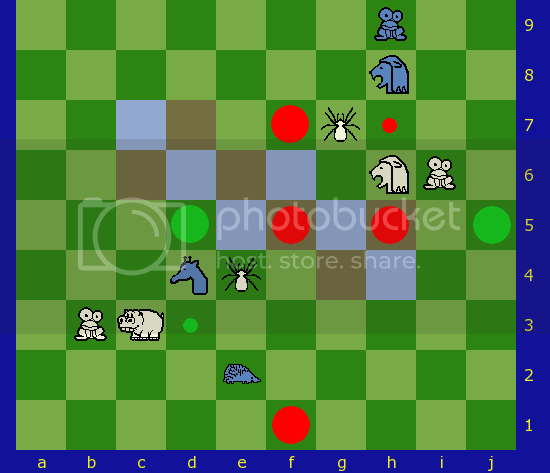 If the animal is an enemy, it is removed from the game board. If a Frog rests next to an enemy Frog, you must use your turn to capture the enemy Frog regardless of any other situation on the board, provided that the move is legal. Frogs may never move or leap in a backwards direction unless affected by another animalâ€™s ability, but they may leap side to side. Frogs may freely land on and move through swamp squares. The above diagram details the regular movement patterns of a Frog. The lines from the b2 Frog show that it can move diagonally forward, but not backwards. 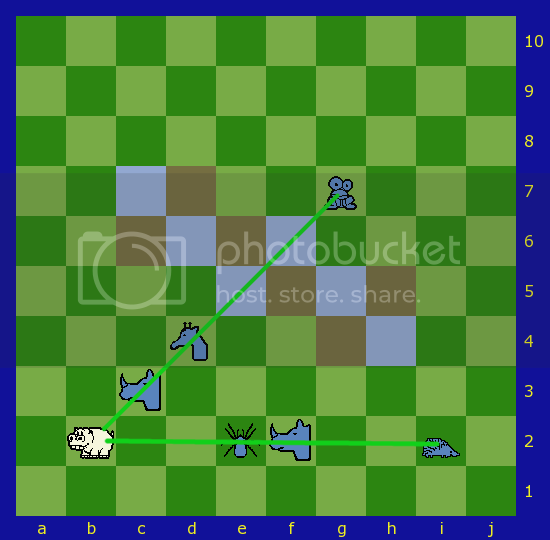 The lines from the f3 Frog show that he cannot move diagonally since the diagonal movement is a non-capturing move. The green circles at d3, d5, f5, h3, and h5 show where the f3 Frog can leap. If the Frog leaped over the enemy Rhino or Crocodile, that piece would be captured. The red circle at f1 is there to show that the Frog cannot leap backwards. The red circle at j6 and the green circle at h5 are there because the Frog at j4 is mandated to capture the i5 Frog, thus he must ignore the Rhino. Ability 1 â€“ Sticky Tongue: Frogs are natural predators of insects and especially love larger meals, such as the Jungle Spider. If an enemy Jungle Spider is within (2) spaces directly away from the Frog, with no pieces in between, the Frog may grab that Jungle Spider with its Sticky Tongue and satisfy its appetite. The Frog does not move from his square, but the Jungle Spider is removed from the board. This ability counts as a move. The above diagram shows different circumstances in which a Frog could use Sticky Tongue. From the Frog's location, the Frog can devour the Jungle Spiders with the green circles around them. It does not matter if they are across the swamp or in a backwards direction. The ones with the red circles around them are safe from the Frog. One has a Hippo directly in between the two animals and the other is (2) spaces away, but not in a straight line. Ability 2 â€“ Leap Frog: After a Frog performs a leap over a friendly animal, the Frog has the option of making (1) additional leap, following the rules and regulations of a standard Frog leap. This ability and option becomes a mandatory move, regardless of any situation on the board and provided that the leap is legal, if the Frog lands next to an enemy Frog after the initial leap. In this situation, that Frog must leap over and capture the enemy Frog, if it is able to. Leaps over all other enemy animals are optional if no enemy Frog is present or a leap over the enemy Frog cannot occur. Leap Frog may only be used to leap over enemy pieces. This leap may change direction from the first leap, but still may never be in a backwards direction. This ability counts as a move. The above diagram shows Leap Frog scenarios. For the b3 Frog, he is able to use his turn to leap over the Hippo. Leap Frog activates as an optional move since he leaped over a friendly animal. Here, if the Frog were to use Leap Frog, he could only leap over the enemy Giraffe and capture it. He is unable to leap over the friendly Jungle Spider since it is not an enemy piece, nor the enemy Porcupine since he'd be leaping in a backwards direction. The h9 Frog uses his turn to leap over the friendly Lion. The little circle is red here because Leap Frog is activated and becomes a mandatory move since it is a legal move to leap over the enemy Frog that he lands next to. In this circumstance, the initial leap of the Frog is an optional move, but since he made it then the next leap over the enemy Frog is required. He is neither able to Leap Frog over the Jungle Spider nor the Lion due to this, but would be able to had the enemy Frog not been present. Swamps are full of dangers to little Frogs. If a Frog happens to make it to the other side of the swamp, they leave that swamp a changed animal. Theyâ€™ve become Poison Dart Frogs. This transformation only occurs at the end of the current turn and only if the Frog resides in the zones indicated in the below diagram. Poisoned Frogs are still able to transform into Poison Dart Frogs. Frogs transform to Poison Dart Frogs (see below) at the end of the turn their player's turn, if they rest in the shaded area of their color, regardless if they have made it to that area on their own accord or by another animal's special ability. -	They never subject to the mandatory capture rules that Frogs are. -	They are now capable of moving in a backwards direction (both in all of its movements and its abilities). Ability 3 â€“ Poison Dart: Poison Dart Frogs use their newfound knowledge to shoot a Poison Dart at any single enemy animal within (2) squares from it in a straight line. As with the Sticky Tongue ability, the target cannot be obstructed by another animal. Poisoned animals are still able to move and capture, but are not able to use any abilities. Poison Dart Frogs are immune to poison. Using this ability counts as a move. The Poison Dart Frog above wishes to use the Poison Dart ability. The Frog and Lion with green dots on them are within (2) squares from the Frog and thus are able to be hit with this ability. The Hippo has a red dot on it because there is the Giraffe in the way. The Frog with the red dot on it is (2) squares away, but can't be hit because it is not in a straight line. In order to ease the burden of explanation throughout the entirety of the 'Piece' section, unless otherwise noted, Poison Dart Frogs are also referred to in any mention of the term "Frog". Jungle Spider â€“ Do not read further if you have arachnophobia. Jungle Spiders are small and quick. They may move up to (3) spaces in any direction. They may even change direction after every square moved, allowing them to easily scurry around the bigger creatures. Jungle Spiders may not end their move on the square that they started on or on a swamp square, but they may move through the swamp. It cannot capture. The above diagram shows a very limited movement diagram of a Jungle Spider. 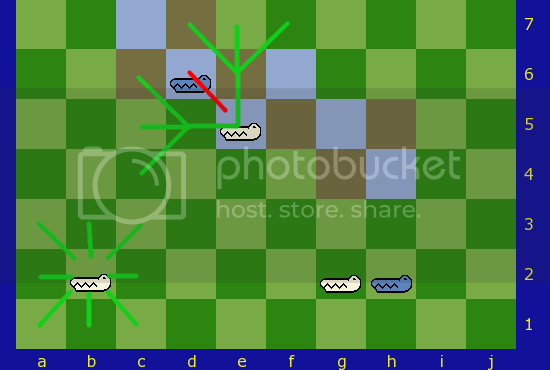 The white Jungle Spider can move and stop on every square that the green line crosses, except for the swamp squares (e5 and g5). Please note a few things - the Jungle Spider can cross swamp squares (but not land on them), it can scurry around animals (but not through or over them), and it can move at most (3) squares during its move. It can also move (1) or (2) squares. Ability 1 â€“ Jump: Surprise! Jungle Spiders are also jumping spiders. They can Jump either (2) or (3) spaces in a straight line to an empty square. Using this ability, a Jungle Spider can leap over other animals and swamp squares, but is not able to land on either. Jungle Spiders can Jump through the Porcupine's Untouchable zone, but cannot land inside it (see below Porcupine section). This ability counts as a move. Using the same diagram, we can see now additional movement that the Jungle Spider can make utilizing Jump. The Jungle Spider can Jump over any piece to a green circle. It is unable to Jump to the squares e5, e6 and g5 because they are swamp squares. It is also unable to Jump to h6 because it is occupied by the Hippo. Ability 2 â€“ Web: Jungle Spiders are also able to capture extremely large animals in their webs. All enemy animals that rest next to a Jungle Spider are webbed in place and cannot move, capture, or use active abilities until the Jungle Spider moves more than (1) square away from the animal or is captured. Abilities that are not used as moves, such as the Porcupine's Quill's are still active. Enemy animals are able to move through the squares next to the Jungle Spider freely, but are webbed if they stop their move next to it. Enemy Jungle Spiders and any animal on swamp squares are immune to Web. Webbed animals are not immune to other animals' abilities, such as the Giraffe's Fling. This ability is always active and does not count as a move. 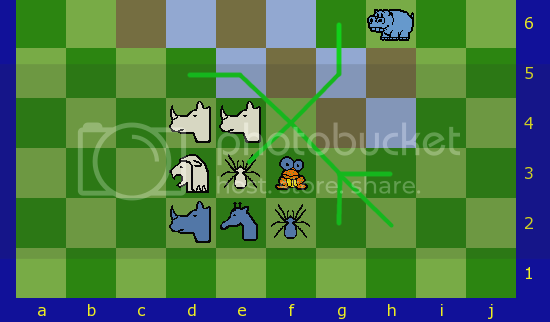 Note: Utilizing the above diagram, again, note that the enemy Rhino, Giraffe, and Poison Dart Frog are all Webbed in place. They can neither make a move, nor use an active ability. Ability 3 â€“ Poison Fangs: Run for the hills! Jungle Spiders are also venomous! After a Jungle Spider moves, it is able to bite an enemy animal next to its final square reached, poisoning it. Alternately, it is able to use up a turn without moving by biting two adjacent enemy animals and poison them. Poisoned animals are still able to move and capture, but are not able to use any abilities. Jungle Spiders may not use Poison Fangs during the same turn they use Jump. Note: Utilizing the above diagram, again, note that the Jungle Spider can use its Poison Fangs to poison any combination of up to (2) of the enemy Rhino, Giraffe, and Jungle Spider. Per the Poison Dart Frog section, Poison Dart Frogs are immune to poison. Alternatively, the Jungle Spider can scurry to either g6 and poison the Hippo or g2 and poison the Jungle Spider. Crocodile â€“ Crocodiles are the masters of the swamps. Though they are not restricted to moving only on swamp squares, their powers increase while resting on one. When starting on a swamp square, a Crocodile can move and capture enemy animals up to (2) spaces in any direction. They may change direction over each square moved, but it may not end the turn on the square started on. A Crocodile cannot capture more than (1) animal in this way and must stop on the square which it encounters an animal on. If the move starts outside of a swamp square, the Crocodile is limited to only (1) square in any direction. A Crocodile is also only able to use it's abilities if its move starts on a swamp square. A Crocodile may not capture another Crocodile that is in the swamp. The above diagram shows different movement schemes for the Crocodile. The green lines from the b2 Crocodile show that it can only move (1) square in any direction. It is limited to (1) square due to started its turn on a jungle square. The green lines from the e5 Crocodile show some of the movements possible for it, as it is starting on a swamp square. There are more movements, but listing them all would be overbearing on the map. Note that it cannot capture the enemy Crocodile that also rests on a swamp square. The last white Crocodile on g2 is both able to capture and be captured by the black Crocodile on h2, since neither are in the swamp. Ability 1 â€“ Submerge: When you think of Crocodiles in the swamp, most people think that they look like logs and are hard to distinguish. Wild Kingdom Crocodiles use this to their advantage. If a Crocodile is on a swamp square, that square is treated as a jungle square by friendly animals. These animals can step on the â€œlogâ€ that the Crocodile creates in order to cross the swamp easier, but they may not stop on the square with the Crocodile on it. For the purpose of abilities that require empty space between animals (like the Sticky Tongue and Poison Dart abilities), a submerged Crocodile counts as an empty square, though Frogs can Leap Frog over one. This ability is always active and does not count as a move. The above diagram shows the usefulness of the Submerge ability. Using submerge, both the white Giraffe and the white Rhino can threaten the black Giraffe and the black Rhino without threat back (see Rhino and Giraffe sections for detailed movement plans). The reason this is possible is because the swamp squares limit the attack range of some animals. Ability 2 â€“ Drown: Crocodiles tend to kill their prey by dragging them under water. If a Crocodile rests on a swamp square and has an enemy animal next to it, it snatches that animal in its mouth and drags it into the water and Drowns it. 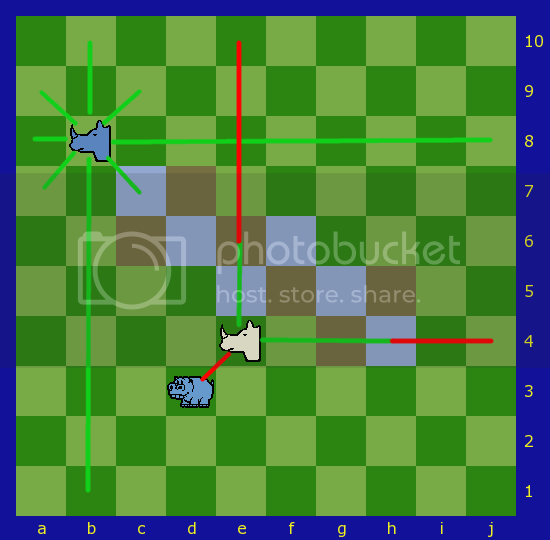 The Crocodile can move back to the same square it started from or another swamp square adjacent to the captured animal. This ability counts as a move. The above diagram shows a Crocodile using Drown on a Hippo. The Crocodile can go back and end its turn on the same square it started from or it can move to any swamp square that is adjacent to where the Hippo was. Porcupine â€“ Poor Porcupines! Nobody wants to be around them for fear of getting poked by their quills. Porcupines are rather slow creatures and can only move and capture (1) space in any direction. Porcupines may not enter the swamp area. Ability 1 â€“ Untouchable: Because of the Wild Kingdomâ€™s fear of getting stuck by the Porcupineâ€™s quills, no enemy animal, except for other Porcupines and Lions, may freely move to or pass through any of the (8) squares (to include swamp squares) that are surrounding the Porcupine, unless the move was made to capture the Porcupine. Rhinoâ€™s can still use their Tough Guy ability (See Rhino section) to move through a Frog in this zone, as long as the move results in the capture of the Porcupine. Animals starting their turn next to an enemy Porcupine do not have to move, but must either capture the Porcupine or move out of the area without crossing any more of these Untouchable squares if they do. Lions are immune to this ability. Frogs and Poison Dart Frogs can still capture Porcupines using the Leap Frog ability. Pieces moved by the Giraffe's Fling ability are not affected by this ability. This ability is always active and does not count as a move. The above diagram outlines a few things. The green lines from the black Porcupine show that it can move (1) square in any direction. The different colored lines around the white Porcupine outline the movement capabilities of the surrounding pieces (see their individual sections for detailed movement). The d1 Rhino is able to move up to the Porcupine's Untouchable zone, but may only enter it if it captures the Porcupine. The same occurs for the black Giraffe. The e1 Rhino cannot capture the Porcupine, so it must stop its move before hitting the Untouchable zone. The black Porcupine can enter the Untouchable zone since it is immune, as can/is the Lion. Lastly, the black Frog can enter and capture the Porcupine by leaping over the Giraffe and using its Leap Frog ability (see Frog section) on the Porcupine. Ability 2 â€“ Quills: Any animal that captures a Porcupine is stuck by it's Quills and is also removed from the game. This ability does not affect Lions, Frogs, and Poison Dart Frogs. This ability is always active and does not count as a move. Rhino â€“ Rhinos are the big bullies of the Wild Kingdom. They take great pleasure in picking on the smaller animals, especially the Frogs. Fortunately, a mutual understanding occurs between Rhinos and Frogs on the same teamâ€¦ at least for the duration of the game. Rhinos move and capture any amount of spaces orthogonally. They also have the ability to move one space diagonally, but are not permitted to capture with this movement. Rhinos prefer solid ground and swamp squares really slow them down. A Rhino must always stop on the second swamp square that it moves through on a turn, not counting the square that it started on. The above diagram shows the Rhino movements. The green lines from the black Rhino shows that Rhino can move as many squares as it wants orthogonally and (1) square diagonally. If you look at the white Rhino, you'll see how the swamp limits its movement. It has to stop on the second swamp square crossed. 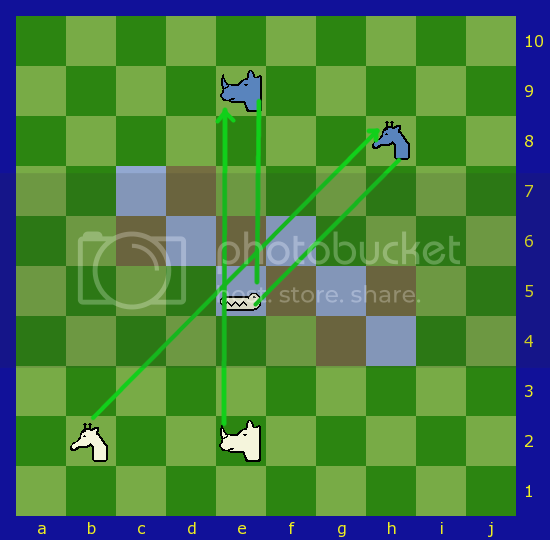 Also, it is unable to capture the black Hippo because its diagonal move is non capturing. Ability 1 â€“ Tough Guy: Rhinos act like Frogs donâ€™t exist. In fact, they treat any square that an enemy Frog is on as if the square didnâ€™t have an animal on it at all. A Rhino is able to move through these squares freely. Any Frog on a space that a Rhino moves through is immediately captured. This ability is always active. The above diagram shows a Rhino utilizing the Tough Guy ability. Using this ability, the Rhino can move over the (4) Frogs to capture the Lion. All of the Frogs are removed from the game board after this move. Giraffe â€“ Giraffes are laid back dudes that just want to have fun all the time. Giraffes can move and capture any amount of spaces diagonally. They also can move, but not capture, one space orthogonally. Giraffes do not move well through murky water, thus they must stop on the second swamp square that they move through on their turn. This does not count the square that they start on. The above diagram outlines Giraffe movement. The white Giraffe can move any amount of squares diagonally or (1) square orthogonally. The black Giraffe is limited by the swamp, only able to move to the second swamp square it comes across. It cannot capture the Hippo because its orthogonal move is a non capturing move. Ability 1 â€“ Fling: You can often find Giraffes tossing items back in forth to each other. Coconutsâ€¦ beach ballsâ€¦ Rhinosâ€¦ The fun never ends. Giraffes use their necks as catapults to launch adjacent animals of either player across the board. These animals are flung up to (2) spaces directly away from the Giraffe. Porcupines are unable to be flung. Flung animals stop if they hit the edge of the board. Jungle Spiders flung into the swamp are removed from the board. 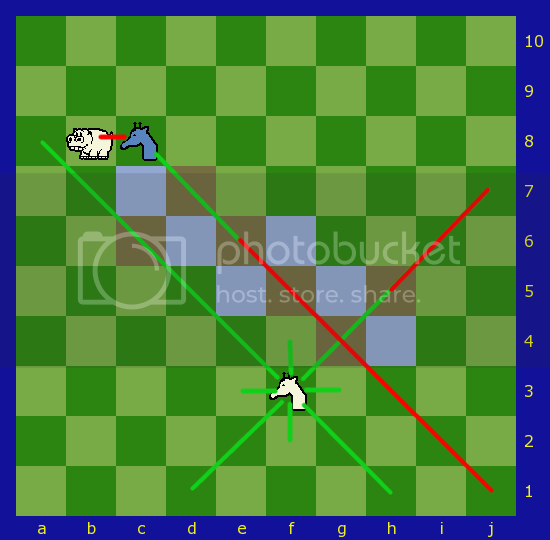 If an animal is flung into another animal, the animal landed on is removed from the game board. If the animal landed on was a Porcupine, the flung animal is also removed from the board. Animals can be flung into an enemy Porcupine's Untouchable region. Webbed animals can be flung, but Submerged animals cannot. Animals cannot be flung over other animals â€“ they must stop on the square of the first animal encountered. This ability counts as a move. The diagram above details multiple circumstances in regards to the Fling ability. The green circles around animals indicate that they can be flung. The black Rhino flung into the Porcupine results in the loss of the Porcupine and the Rhino (see the Porcupine's Quills ability). The Hippo is flung, but has to stop at the border of the game board. The Frog is flung into the Giraffe and cannot be flung further. 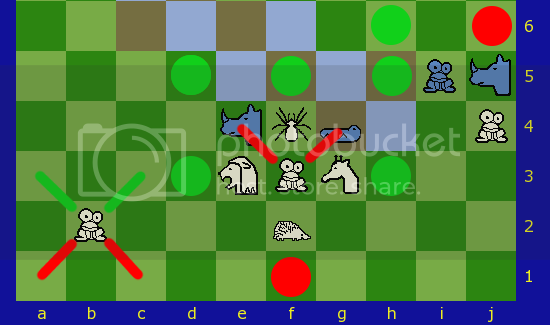 The Giraffe is removed from the board and the Frog replaces it on that square. The Jungle Spider can be flung either (1) or (2) spaces, but it lands on a swamp square in either case. Since Jungle Spiders cannot rest on swamp squares, it is removed from the game. The red circle around the Porcupine indicates that it is not able to be flung, since it is a Porcupine. Not shown above are the rules that you can Fling animals that are webbed (see Jungle Spider section), but can't Fling Submerged animals (see Crocodile and Hippo sections). Hippo â€“ Hippos kill more people a year than Lions, Tigers, and Bears (oh my!). They are extremely territorial and a force to be reckoned with. Hippos move and capture any amount of spaces in any direction. They feel very at home in the swamp and are not limited by swamp squares. 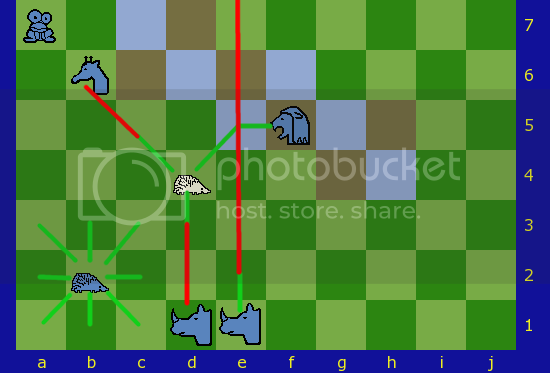 Ability 1 â€“ Submerge: Hippos share the Submerge ability with the Crocodile. See the Crocodile section for an explanation on this ability. Ability 2 â€“ Territorialism: Hippos become quite fierce when their territory is being invaded. Because of this, they gain super strength and can capture multiple enemies within their territory at once. Similar to the Rhinoâ€™s Tough Guy ability, Hippos move through any enemy animal residing in the Hippo's territory as if the square were empty. The animals that the Hippo moved over are captured. Hippos cannot move over Porcupines in this way, though they can still capture them and are removed from the board at the same time due to the Porcupineâ€™s Quills ability. 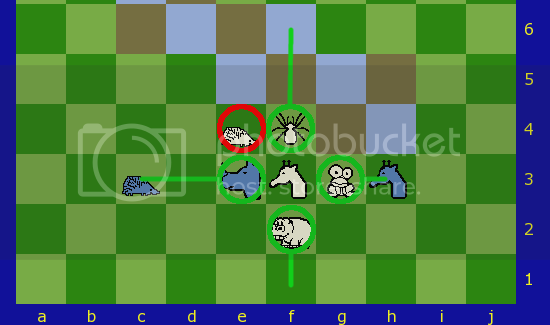 This ability works as long as the animals being captured are within the Hippo's territory, regardless of where the Hippo started her move. The above diagram shows the exact boundaries in which the Hippo considers its territory. The above diagram shows some examples of the Hippo's Territorialism ability. The white Hippo can capture the Jungle Spider, the Rhino, and the Porcupine, but has to stop at the Porcupine due to its Quill's ability. The Hippo would be lost in that way. If she didn't capture the Porcupine, she'd have to stop at g2 due to the Porcupine's Untouchable ability (see the Porcupine section). The Hippo can also move diagonally and capture the Rhino and the Giraffe, but since the Frog is not in its territory, it can capture it, but may not move through it as the other two animals. Lion â€“ Lions are undoubtedly the kings of the Wild Kingdom. They move and capture up to (2) spaces in any direction, and are able to change direction mid move, just like the Jungle Spider. Lions are immune to all Porcupine abilities, but can still be captured by Porcupines. A Lion stops moving if it captures another animal. Lions may not land on the same square they started on, nor may the leap over animals. Lions are not limited by the swamp squares. The above diagram shows examples of Lion movement and capture. The Lion cannot leap over pieces, so it is not able to reach the b column. The Lion can capture the Porcupine without fear of its abilities, but it cannot capture both the Porcupine and the Rhino in the same turn. It can, however, move around the Porcupine to capture the Rhino. Ability 1 â€“ Swipe: Lions like their space. If you imagine the Lion as the center of a 3x3 square, it is able to Swipe aside all animals on one side of that square. All animals, including friendly animals that are on the side swiped are removed from the game board. This ability can be used if the Lion rests on the edge of the game board; even on sides that donâ€™t have a full (3) squares. This ability counts as a move. The above diagram outlines the Lion's Swipe ability. The green circles around the white Lion show the (4) sides that can be Swiped by the Lion. The black Lion can Swipe any of the (3) sides available to him, even though (2) of those sides are partial. All animals on the side that is swiped are removed. The Lion can swipe Porcupines due to its immunity to the Porcupine's abilities. 1. You capture your opponent's Lion. 2. You move your Lion to the last row on the board. This is row 10 for white and row 1 for black. 3. If your opponent is unable to make a move at the beginning of their turn. This game is the result of years of development and play testing. Development began in 2009 and ended in 2017. It was invented by Nicholas Wolff. Fergus - For the piece sets, GC help, and GC access. Gary, Joe, Carlos, Vitya, Jose, Jeremy, and anyone else that I've left out - For the relentless play testing, ideas, and rules clarifications. There's been a lot of criticisms on this game and I appreciate it immensely. There have also been a lot of praises which have also been appreciated. I've taken so much away from it all and hope the end result is worth all of the trouble. This game really is the fruit of your labors. There are many different types of pieces and many different types of moves and abilities. I tried my best to make them as lifelike as possible to the real jungle, while not compromising the playability of the game. I feel that because of this, once you start to get to know the pieces, it's rather easy to play. As with most games with the complexity of this one, rule clarifications may be needed in the future. If you come across a clarification, please contact me at [email protected] to have it addressed and the rules modified. Though this game has complexity, I aim to try to program a preset that enforces rules, as well as a Zillions of Games file, if it is possible. Any help is always appreciated for these.